This family oriented railroad event was held at the future site for the Fullerton Railway Plaza next to the Fullerton Santa Fe Depot on May 1 & 2, 1999 with an estimated attendance of over 15,000 visitors! On display on one Fullerton siding was an Amtrak train consisting of F59PHI locomotive #452, the Amtrak Coast Starlight Pacific Parlour Car and a Superliner Sleeping Car (Number: 32078 / Name: Florida). On display on the other Fullerton siding were the Overland Train and Silver Hollow private cars. BNSF SD75M locomotive #8279 painted in the old Santa Fe War Bonnet colors was also on display. Except for the Amtrak locomotive, visitors were allowed to walk through all of these cars, including the BNSF locomotive. The Amtrak locomotive had to remain closed to visitors since it was kept running to provide hotel power to the other cars. 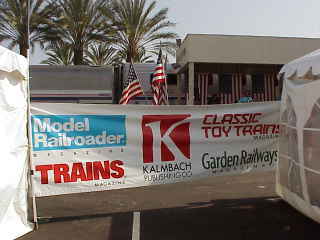 PHOTO HIGHLIGHTS OF FULLERTON RAILROAD DAYS 1999! The very first railcar to enter the new Fullerton railroad sidings was the Silver Hollow Pullman private car at about 1:30 A.M. on Friday morning, April 30, 1999. That car entered the siding closest to the Track 1 mainline. Click here to view photos and video clips of that event now. to support the effort to build a rail museum in Fullerton! Joining the Fullerton Railway Plaza Association. Fullerton Santa Fe Depot & City Information. A BNSF SD75M locomotive #8279 painted in the old Santa Fe War Bonnet colors was on display at the new sidings at the Fullerton Santa Fe Depot. As of Monday, May 3, 1999, this locomotive is still at the siding and can be seen at www.trainweb.com/frpa/webcam. A single train consisting of an F59PHI, a Pacific Parlour Car, a Superliner Sleeping Car, and the Overland Trail was brought down from Los Angeles to Fullerton at around 7 A.M. on Saturday morning, May 1, 1999. 1999. The Overland Trail was pushed into the siding closest to the main line and coupled to the Silver Hollow which had arrived the previous day. The rest of the train then moved forward and then backed into the siding closest to the loading dock. All of the above train activity was able to be viewed live on the FRPA WebCam at www.trainweb.com/frpa/webcam. Although there were a number of rumors about the possible appearance of the Santa Fe 3751 Steam Locomotive, you will not find it on any of the lists of announced events. Such an appearance could not be included as part of the official program until a firm commitment was received that the 3751 would appear. There was some hope right up to the time of the event that there might be a change in plans and that the 3751 would come to Fullerton Railroad Days. Siding space was left available just in case. There were two main rumors going around at the event as to why the Santa Fe 3751 was not on display. We'd like to provide additional information to squelch those rumors which are not based on fact. The first rumor is that the BNSF would not give permission to move the Santa Fe 3751 from the Redondo Roundhouse to Fullerton. That is totally untrue. The BNSF was extremely cooperative in making Fullerton Railroad Days possible. They placed equipment on display at the event and helped with the move of other equipment to the event. The help provided by the BNSF is greatly appreciated. Fullerton Railroad Days could not have turned out to be the success it was without the efforts of the BNSF. Permission was granted by the BNSF for the Santa Fe 3751 to be brought from the Redondo Roundhouse down to Fullerton for this event. Please help us squash the rumor that the BNSF blocked the move of the 3751 to this event. The other rumor going around is that Amtrak blocked the move of the 3751 because they wanted it on display at their open house for employees at the Redondo Roundhouse. This is also not true. Amtrak did offer to put the locomotive on display at the roundhouse if it was not going to be used elsewhere that day. Amtrak did make it clear that any other public event should take priority over the display of the locomotive at their employee in-house event. The efforts of Amtrak to bring the 3 pieces of equipment that they brought to this event is also greatly appreciated and added a lot to the success of this event. Amtrak did not block the move of the 3751 to this event and we would appreciate your help in squelching these rumors. 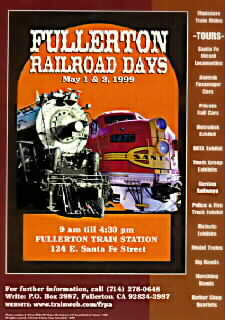 Click here to see the original page announcing the 1999 first Fullerton Railroad Days.